Being curled up by a fireplace, mug of tea in hand, feeling at home surrounded by candles and kindreds and an invitation to be present to this moment. Sitting beside someone who is quickly becoming a friend as you each share your creative dreams and brainstorm how to live them into reality. Giving yourself the gift of time alone to spend in whatever way you choose without any expectation of what you need to do next. Beginning your day with the smell of baking cinnamon rolls, bowls of fresh fruit, mugs of coffee and tea, and books of poetry. Giving yourself permission to walk along the water, to play with paper and glue and color, or to simply sit in the quiet remembering yourself. Finding your way to laughter and silliness and the decision that staying in pajamas all day (even when you're in a workshop) is the perfect one for you. Having the space to simply listen to what you most need and then realizing that you are surrounded by dear souls who will support you as you make it happen. What does Water Your Soul really mean? It's about creating space for you, space for your soul care practice, in the midst of whatever life hands you. It's seeking the in-between moments and nourishing yourself. It's saying "Yes" to filling up your internal well, so you can be more present to your life and your loved ones. It's honoring The And Space - the place where we hold the beauty and the grit - and learning the ways you can support yourself in that space. It isn't always easy, which is why we come together to practice it. It isn't always pretty, which is why we circle to tell the true stories to be reminded that we aren’t alone. But it's a choice we can explore. Each day. It's a choice to say: I am ready to deeply connect with me, to be with myself in the quiet, to listen to what I need. And this retreat is going to help you make that choice a little more each day. 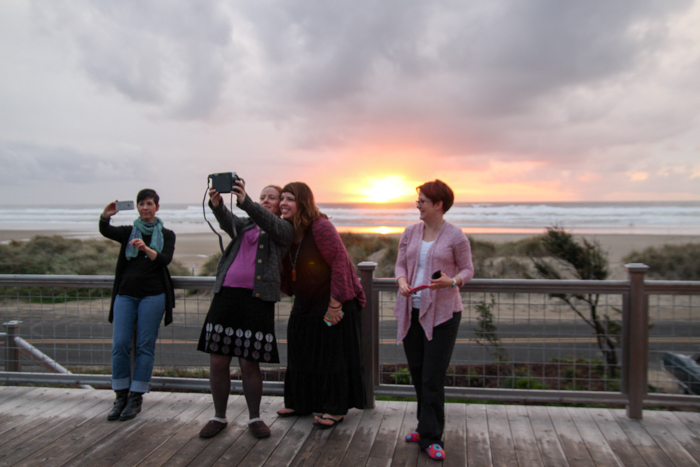 At Water Your Soul, we'll gather in a gorgeous ocean-front home in Manzanita, Oregon. We'll spend time learning about and experiencing soul care and mindfulness practices. We'll create the beginnings of an art journal, take some photos, share some stories, and even write a poem or two. We're also going to spend time deeply nourishing ourselves with food, walks on the beach, sitting inside by the fire, and maybe even have a dance party (okay, we will have a dance party). 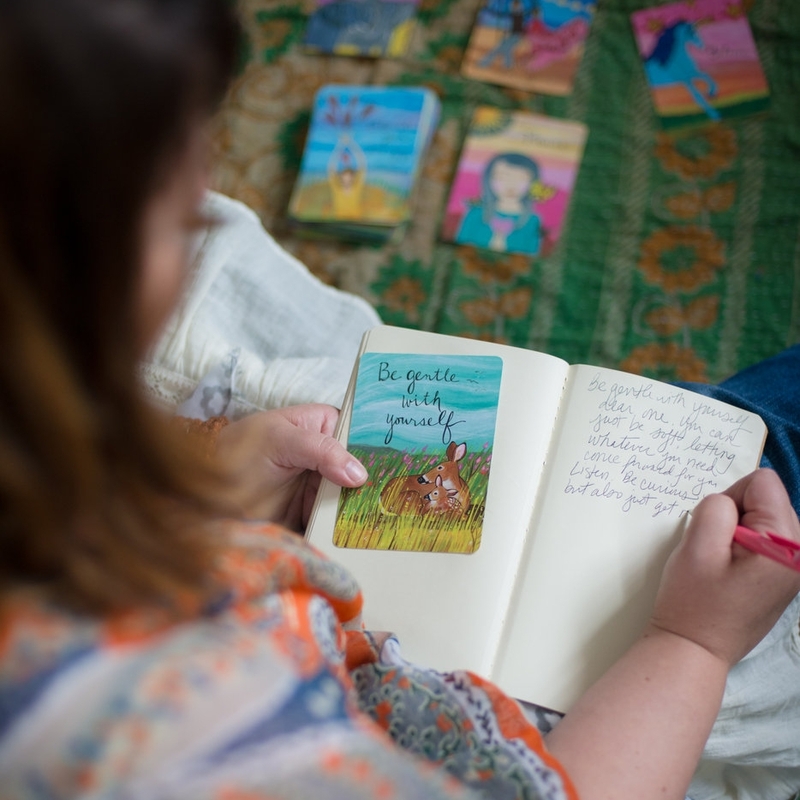 We'll spend time practicing and learning about creative self-care as we play with words, take some photos, walk on the beach, and explore other forms of creative play and connection. You'll explore ways to seek stillness and spend time in the quiet. We'll talk about how you can create an individual mindfulness practice when you get home. The Pacific Ocean will be a teacher for us as we connect with her each day as she's literally steps away from the home where we'll gather. We'll also practice a story releasing ceremony and invite her to hold our stories. 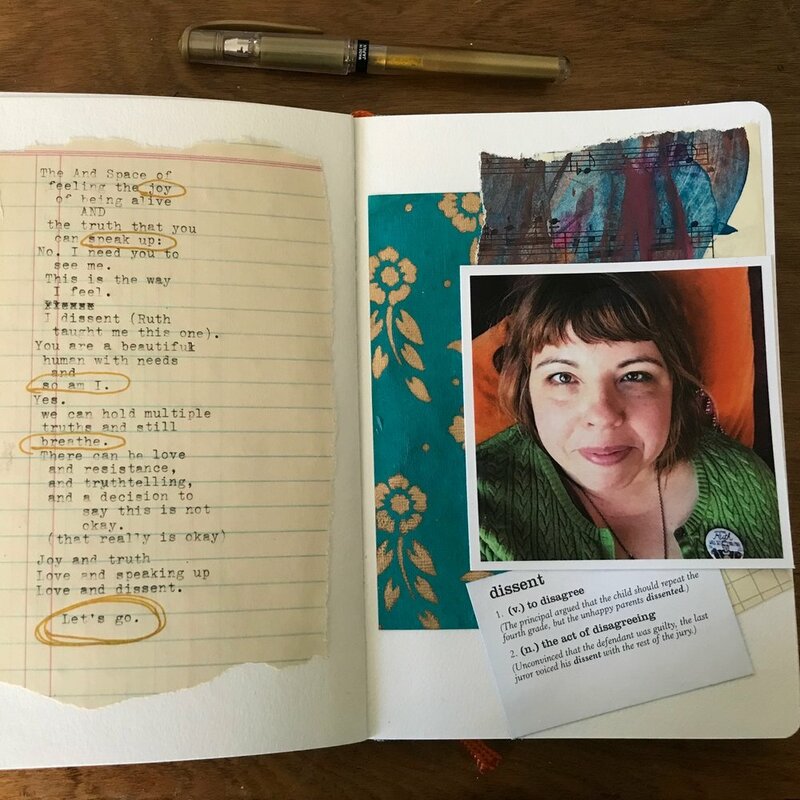 We will be filling up a journal with papers, paint, collage, writing, dreams, blessings, prayers, and so many other good things as I teach you some of my favorite journaling practices. 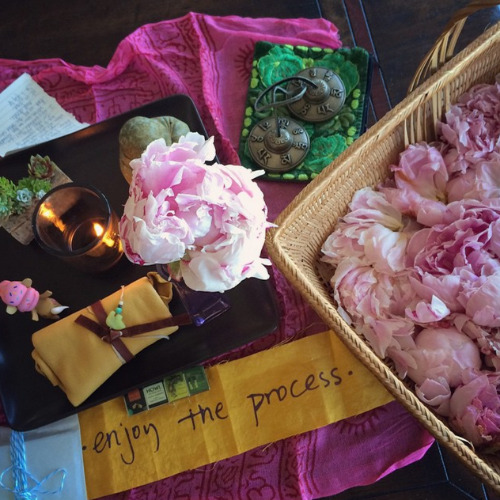 We'll slow down and deeply experience mindfulness practices, create a community altar in the middle of our circle, and look at ways we can create space for the sacred in our daily lives. There will be time to tell your story and listen to the stories of others. Many of the dear souls who attend Be Present Retreats form friendships that last far beyond the retreat. And dear one, this retreat has come together in the most magical way! The short(ish) version: I had a dream (like a real dream at night while I was asleep) in late August where I wrote a Facebook status asking if a few people wanted to gather with me in late November for a retreat in Manzanita. So many people said yes! And the dream shifted to the retreat and we were gathered in a moment full of candlelight and laughter and poetry and connection and it felt so real. I woke up filled with that magic plus missing leading retreat so much (it's been a couple of years). So I wrote a status on Facebook (in real life) and said that I'd had this dream. And there was a chorus of replies saying, "I have this dream too. Can we do it? Can we make it happen?" And here you are reading these words. We did. We made it happen. And I so hope you can come along. An open environment that holds space for truth, laughter, moments of quiet, and the opportunity to share your story. A heart-opening five-day experience that begins with a welcome dinner and opening ceremony on Wednesday evening and ends with a closing ceremony Saturday evening and farewell breakfast and one more gathering Sunday morning. Daily group gatherings/workshops led by Liz where we'll dive into creative and mindfulness practices to water our soul. Meals* and snacks that will nourish you and invite you to see food as a form of soul care. Time on your own to rest and recharge. A chance to practice self-care so you can begin to truly implement your own self-care and mindfulness practices when you go home. Goodies to take home that will help you add to your go-to creative self-care toolbox (so leave room in your suitcase!). Surprises and other treats throughout our time together. Note: There are just 12 spots available at the Water Your Soul Retreat with just 8 lodging spots in the main house. Information and lodging options are below. Before the retreat, I'll share a suggested supply list for the creative activities you'll be doing on this retreat. 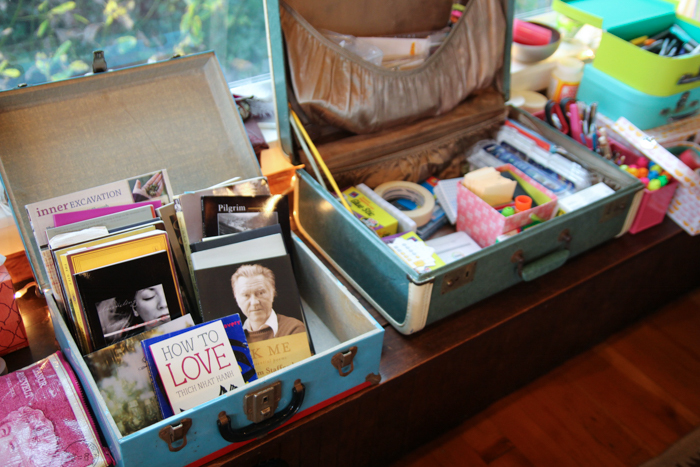 I'll also be bringing my usual vintage suitcases full of creative goodies and supplies for you to have fun with. *Meals include: Breakfast every morning, dinner Wednesday through Saturday, and lunch on Thursday and Saturday. Friday's lunch time will be on your own in town. There are many delicious options! GF and vegetarian options will be provided at every meal. Please share any food allergies on the registration form and we will take those into consideration (as much as possible) when planning meals and snacks. If you have food concerns, we will communicate with you as we get closer to the retreat so you can decide where you might need to supplement based on your individual needs. We'll gather in an oceanfront home (see photos below) in Manzanita, Oregon, which is a little town nestled just south of Cannon Beach. 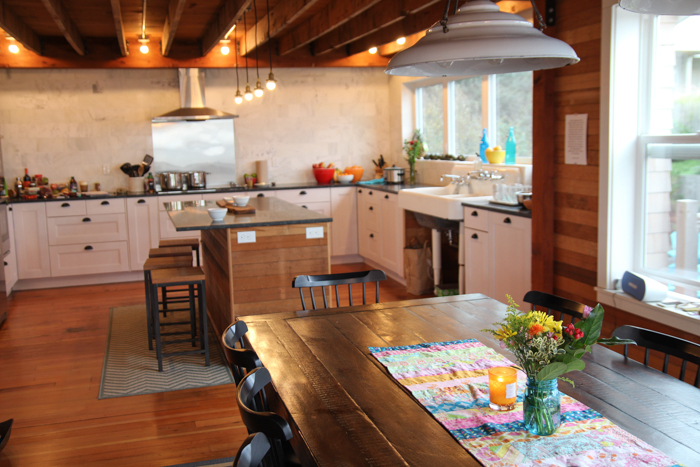 This is one of my favorite towns in the Pacific Northwest, and I'm delighted to be able to bring retreats to Manzanita again since finding the gorgeous Reed House. There are just a handful of rooms available for lodging at the main home (for an additional cost, see registration). Including private rooms with one bed (there is a special "bring a friend rate" for two friends who share a private room), shared rooms with two beds, and bunk bed rooms (bunks are adult-sized). There are several other lodging possibilities in Manzanita including hotels and rental homes. Participants can connect in our private Facebook group about sharing other lodging. Depending on numbers, there is the possibility of renting additional housing nearby for everyone else, and I'll be in touch with options after you register. Note that the nearest airport is in Portland (PDX) and is about 90 minutes or so from the coast depending on traffic. Transportation is not provided. There will be a private Facebook group for participants who want to connect ahead of time about renting cars together and carpooling etc. Many returning participants tell me that this ride to the ocean with new friends is one of their favorite parts of the retreats held on the Oregon Coast. The Main House will open at around 4:00 PM on Wednesday and we'll be done with our final gathering by about 10:30 AM on Sunday. Notes on accessibility: The main house is three stories, with the main floor in the middle where our gatherings will be held. Bedrooms are on all three floors. Sturdy stairs are available. It is not wheelchair accessible. Chairs will be available for group gatherings/workshops. Please send over any questions. Thank you for your interest in signing up for Water Your Soul! If you haven't already, please take the time to explore the details about this retreat and then read the information below before you fill out the form and pay your registration. 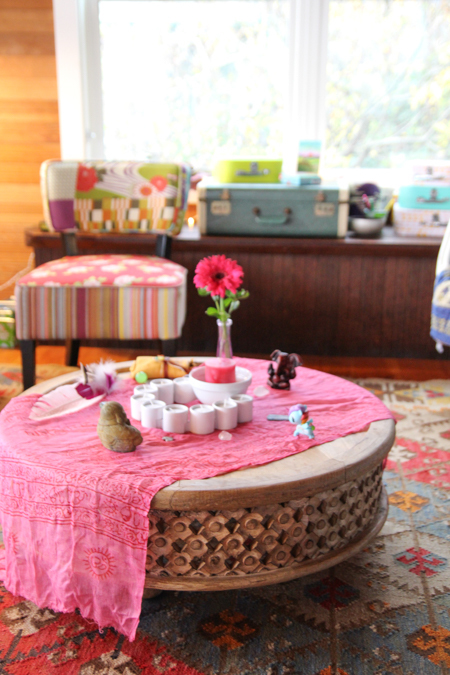 There are 12 spots available at this retreat. 8 spots available in the main house with 2 spots left for people who want to find their own lodging. Tuition for Water Your Soul is $1285 and includes all that's shared in the Details section (note that lodging and transportation are not included). Lodging is available on a first-come first-serve basis for an additional amount as follows. Note that all lodging includes shared bathrooms. 2 spots without lodging are available as well. You need to create some space in your life and want a safe container to nourish yourself. You're longing for some time with kindreds. You love getting to the good stuff in conversation and being with people who are willing to go deep is your jam. You've been stuck trying to find a self-care rhythm or need a reboot and are open to making some changes. You enjoy writing, making, tapping into the creative soul inside you (or you've been longing to). You are in The And Space of the beauty and the grit and you want to learn and experience ways to navigate that space. You're open to a bit of woo woo, and oracle cards, essential oils, and evenings lit by candles make you happy (or at least curious). You want to breathe deeply, laugh widely, and open your heart to the magic that arrives in a circle of kindreds. You're looking for a spa-like or solitary experience. This retreat includes a lot of time in community in shared spaces. However, INTROVERTS - I've got you! There will be time to rest and recharge away from the group. You're expecting sunny days on the beach (it rains in the Pacific Northwest - and warm rain gear will be needed). You're experiencing something in your personal life that needs more support than can be given in this environment. I am not a certified therapist. While the activities we will do might feel therapeutic, they are not in place of therapy or other professional support. Feel free to get in touch if you have questions about this. You're hoping for three days of art workshops. While we will be having fun with some art journaling and other activities, this is not an art retreat. You're hoping for a business retreat about how to run a retreat or online business. While I'll be available for some conversation on these topics, they will not be covered in our group experiences or workshops. And dear one, please get in touch with any questions. I can't wait to circle with you in just a few months! This is going to be so magical.